As New Jersey continues to struggle with an economy marked by low-wage jobs, unemployment, foreclosures, and an increasing cost of living, the Earned Income Tax Credit (EITC) remains a crucial lifeline for low-income families. By lifting families out of poverty and giving a boost to local economies, the EITC is a vital tax credit for the more than 600,000 working New Jerseyans who rely on it ‘to make ends meet.’ Unfortunately, many families are unaware that the EITC even exists, or that they are eligible for these tax credits. In other instances, they spend hundreds of dollars paying high cost tax preparers for services that are available for free at Volunteer Income Tax Assistance (VITA) sites. To respond to this need, Partners for Health issued grants to organizations for the 2019 tax season to provide EITC assistance through tax return preparation, financial literacy classes and targeted outreach to potential clients. 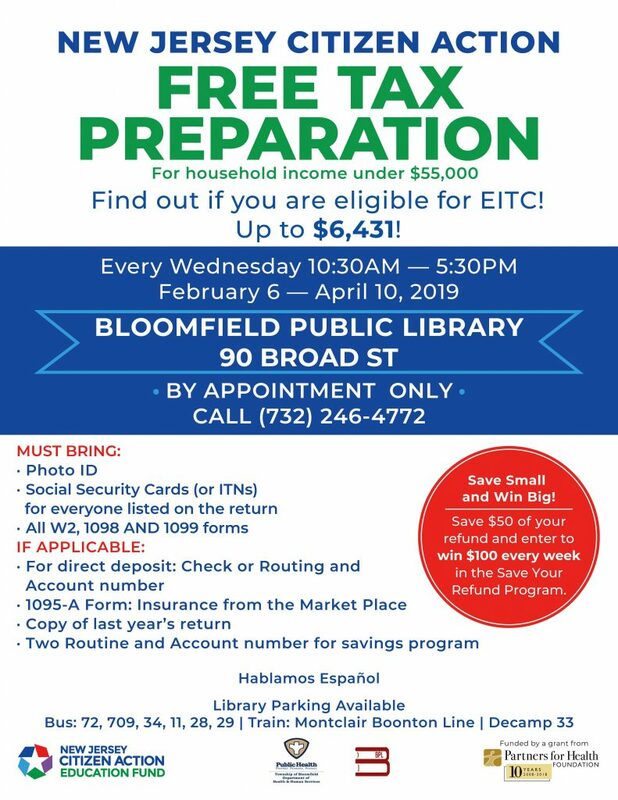 NJCAEF hosted 9 free tax preparation days at the Bloomfield Public Library during the 2018 tax season. By the end of the grant term, NJCAEF provided free tax preparation services to 275 individuals and of those, 66 claimed the state and/or federal Earned Income Tax Credits). In total, $536,914 in refunds were made to the individuals served, with $128,353 in EITC! 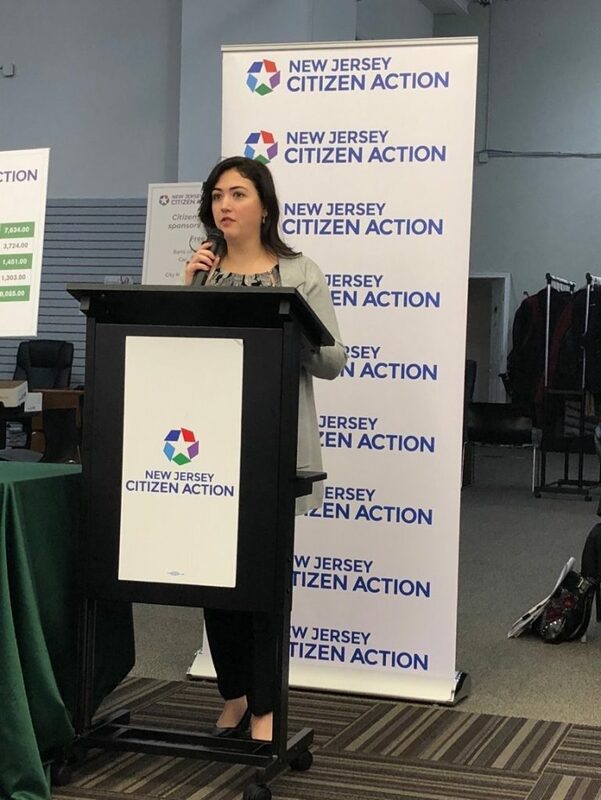 Jackie Gifuni-Koutsouris, Partners for Health Foundation, at the NJCAEF Press Conference to kick off the tax season on February 5, 2019. United Way of Northern NJ completed 330 tax returns in the PFH service area for the 2018 tax season. Of those, 71 clients received EITC. A total of $466,223 refunds were made, with $124,211 in EITC dollars. 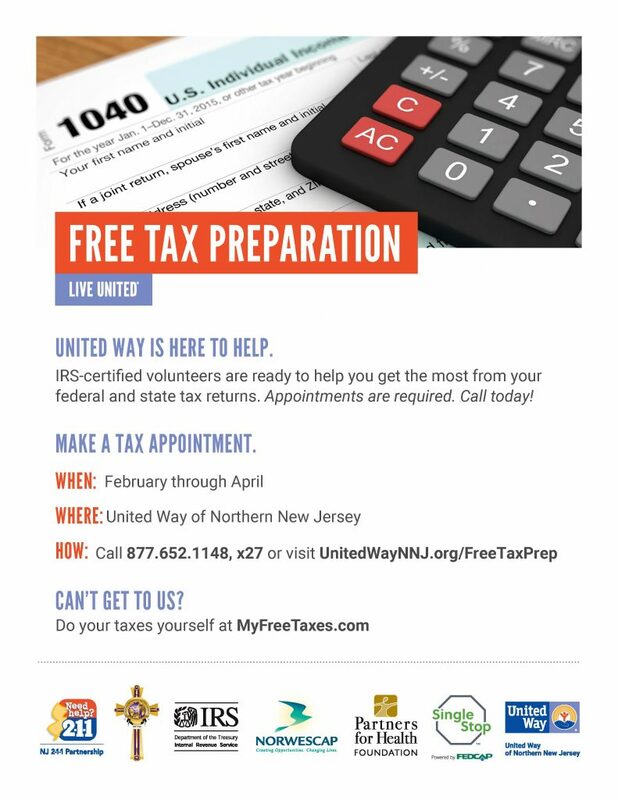 United Way of Northern New Jersey hired an outreach coordinator to provide information on free tax preparation services and available tax credits to a wide variety of organizations and the people they employ and serve. 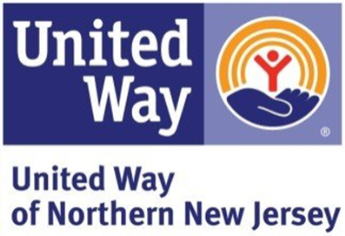 For the 2018 tax season, United Way of Northern NJ provided financial education to 117 individuals in the PFH service area through six workshops, one-on-one meetings, and a scrolling Tax 101 video located at the check-in desk of their tax site in Montclair. HOMECorp’s Financial Literacy program collaborates with the VITA service providers funded by the Foundation to provide financial counseling and education to VITA clients. HOMECorp’s housing counselors will deliver services to approximately 50 clients this year referred by United Way and other community partners. Sessions will vary based on client needs, but typically focus on financial planning around anticipated tax refunds. 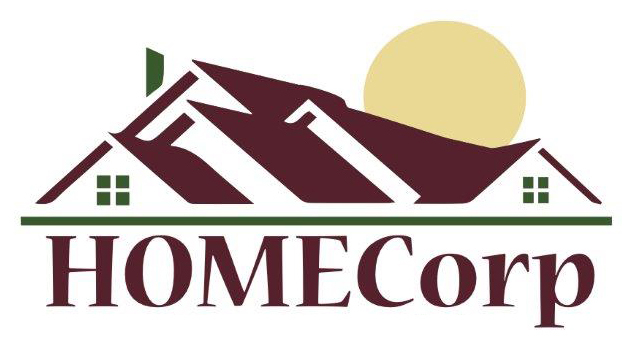 Some clients will even continue with other HOMECorp financial counseling, such as first-time homebuyer, credit coaching or student financial aid planning. Partners for Health Foundation is proud to partner with these organizations once again this tax season.